I wanted to make something living. The name means "The Gilded One." this is really very cool. i like it a lot. you did a really great job! o.o WOW. really inspiring! and super cool collage stuffs. you painted on the decorative paper?? I very like your work! Now I really know what you mean when you saw a photo/scan doesn't compare to the real thing! She is radiant! 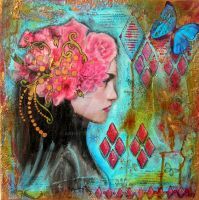 Such beautiful use of mixed media. A classic "living" piece. Very nice use of mixed media! Gorgeous! That's beautiful! I love the flowery patterns you used here! The colors are so solid and pop nicely, I commend you on balancing all those textures, intense! this is so beautiful! it looks almost like she's breathing! Love the different textures and patterns! Looks like it had some Asian influence I think the colours would be even better and the entire piece would come off stronger if the background (decorative paper) was a deep red/scarlet. This is beautiful. Her expression is fantastic, like she knows more than she's telling.